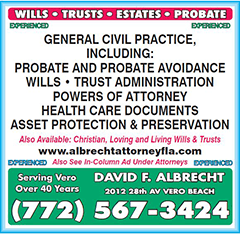 Vero Beach Attorney | David F. Albrecht, P.A. Facing a legal issue that requires skilled representation? There are many adverse effects that you could face if a delicate matter is not handled properly. Legal problems usually don't cure themselves or get better with age. Some such matters include probate, probate avoidance, estate planning, wills and trusts, powers of attorney, buying and selling real estate, construction and liens, corporations, business, and personal injury cases. 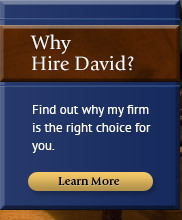 I am David Albrecht from David F. Albrecht, P.A. and I have the experience that you need on your side. My firm has been dedicated to serving the residents of Vero Beach and Indian River County for 40 years. 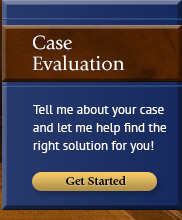 You can be sure that I will put this experience to work for you to achieve favorable case results. 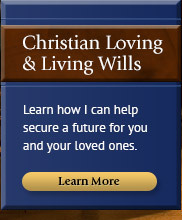 I am considerably experienced in the preparation of Christian, Living, and Loving Wills and Trusts. My firm proudly serves Vero Beach, Sebastian, Fellsmere and all of Indian River County, Florida. Admitted to practice before all Florida Courts, I can practice anywhere in Florida. I am a Past President of The Indian River County Bar Association. 15 years as an Adjunct College Professor of Law at Indian River State College. I am a proud member of the American Association of Christian Counselors. My firm comes highly recommended by past clients. Client's are our best source of referrals. My firm will review your accident or injury cases for free. Furthermore, if after a consultation, my firm is unable to help you with your legal problem, or unable to provide you with the particular legal service or assistance that you are seeking, then I or my office will attempt to assist you to find someone, or point you towards an attorney, who may be able to help you, without any additional charge to you for that service. If you are facing a legal issue, then it is important to have skilled representation. I can assist you with estate planning so you and your future beneficiaries are adequately prepared for what may lie ahead. It is important that your affairs are in order so you may ensure your estate is distributed amongst your beneficiaries according to your wishes. I can help make sure that this happens correctly. 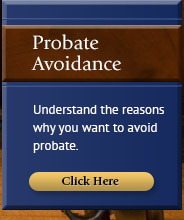 If you are facing the probate process, a Vero Beach probate lawyer from my firm can walk you through it and protect your best interests along the way. If you are seeking to begin a business, then you may have questions regarding how to go about this, and I can help you determine whether you want a corporation, business, or LLC. If you have been injured in an accident due to the negligent acts of another, then you may be able to pursue money damages to compensate for the losses you have suffered. You may be experiencing various financial hardships due to the costs of recovery as well as an inability to work. I understand the difficulties of this situation, and you can be sure that I will work with you to pursue the results that you need. As a general civil practice attorney, I handle many different areas of law, and you can come to me for the legal assistance for a number of situations. I have 40 years of experience in meeting the legal needs of individuals and families. Your situation is important to me, and you can be sure that I will stand by you throughout the duration of your case and work to resolve the matter and pursue the best possible outcome. My firm also handles a wide range of real estate issues including drafting and reviewing contracts and acquisitions. Whether you are looking to sell or purchase property, we can help you prepare the documents and ensure that you are protected and not take advantage of. I have been practicing law for nearly 40 years and I have seen some dishonest contracts over the years. Let my firm help protect your from liability and preserve your best interests. I can help meet all of your commercial real estate needs. If you are facing a legal matter, then it is important for you to begin the process of pursuing the outcome that you need. Many situations are highly sensitive and need to be dealt with efficiently and carefully. Your situation is important to me; let me put my decades of experience to work for you! My firm offers a initial consultation to all prospective personal injury clients so you can sit and discuss your case with me without any financial obligation on your part. 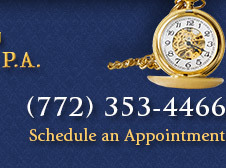 Schedule your consultation today by calling (772) 353-4466! 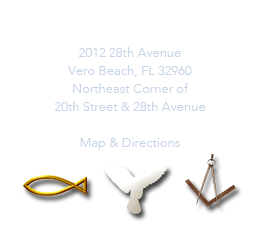 Contact a Vero Beach attorney from my firm today to get started on your case! I proudly serve Vero Beach, Fort Pierce, Sebastian, Palm Bay, Melbourne, Port St. Lucie, and Indian River County. Phone: (772) 353-4466 | Local Phone: (772) 567-3424.